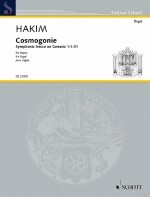 Cosmogonie was written after an improvisation of the composer at the Haarlem International Organ Improvisation Competition, Rotterdam 1981. The given theme was an abstract graphic by Enrique Raxach. The result is an evocation of the opening verses of the Genesis.